This discovery marked the beginning of an inspired period in which Rees committed himself solely to drawing, a marathon which extended well into the mid 1930s. 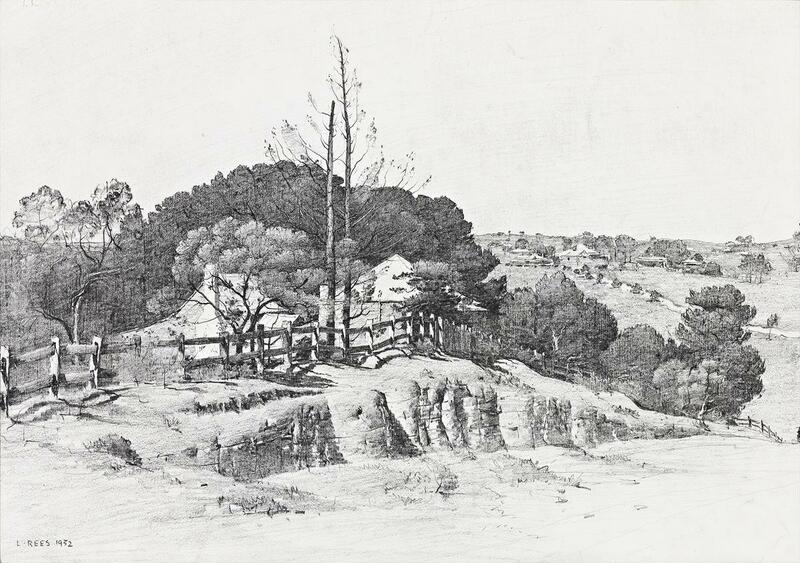 Many of the drawings from this time depict scenes around Sydney Harbour, but it is the road side studies of buildings and trees that convey the artist’s attraction and feeling for the contrast between architecture and nature. Similar views to Farm Houses at Pennant Hills, 1932, identify the location as Thompson’s Corner. This title, with its colloquial overtone, evokes a familiarity that suggests a generally known meeting point or perhaps even a bus stop. The delicate detail in Rees’ drawings of this period is simply staggering; by any measure they are as close as any Australian artist has ever come to the achievements of the Italian masters he so much admired. Rees’ nuanced and inspired drawing is heightened by the virtuosity of his techniques. Surprisingly, Rees’ breadth of tone and line is not achieved by a range of differing lead pencils - but by using only one. His technique of sharpening the pencil against the tooth of the paper while using it horizontality to shade, meant that his shift from tone to line was seamless and in no small way helped Lloyd Rees to achieve the fluid nature of these masterful drawings.